Some Blogs Have Two Credentialed Photographers At The Game. Meanwhile, I can’t even get anyone to return a darn email. And this goes back to before I made fun of their corporate-logo-addled Fan Appreciation T-Shirt. Stay tuned. Bridgeport Likes the Boards. The Sound Tigers spent a lot of time and effort sucking pucks off the boards. It was an effective way to create turnovers, but often they lost track of the center of the ice and it cost them. German Rubtsov Can Do Some Stuff. I don’t mean just the goal he scored, which was very nice. He was around pucks a lot, and got to the front of the net a few times too. He was out there some some special teams as well. It remains to be seen what stuff he can do, exactly, and how often he can do it. While Carter Hart gets all the attention, Ruby could be interesting to watch develop. He probably needs to get stronger–that’s what I’ll be watching next game. This Team Might Be Scary-Good. Hey, there’s a lot of hockey to play and the future is unwritten. But, this was an improved Bridgeport squad and we gave it to them pretty good. And that was without Taylor Leier and Philip Samuelsson. And Carter Hart is going to get even better. Buckle up and enjoy the ride. I wrote some stuff about the special teams units, but I’m going to hold off until Hockey Night on Friday–plus these things will likely change, along with the lines and pairs. Lehigh Valley, Pa. – Nicolas Aube-Kubel and Greg Carey paced the Phantoms offense with multi-goal games and three-point nights while Carter Hart turned aside 30 Bridgeport chances in his pro debut allowing the Lehigh Valley Phantoms to double-up the Bridgeport Sound Tigers 6-3 on Opening Night. Rookie German Rubtsov scored a goal in his North American pro debut on an assist by newcomer David Kase who also was playing professionally on this side of the Atlantic for the first time. A Lehigh Valley Opening Night record crowd of 8,707 fans jammed into PPL Center to welcome the official return of hockey season to downtown Allentown. The 79th sellout in Lehigh Valley Phantoms history also marked the fifth consecutive Opening night sellout for the team and beat the old Opening Night record by 49 fans. The atmosphere was electric early on, even through pregame warm-ups, in anticipation of the big night. The crowd roared through the opening introductions of their favorite players and then offered their approval at the showcasing of the team’s Atlantic Division Championship banner of a season ago which this year’s squad quickly showed they had full intentions of successfully defending. The Phantoms players wore specialty jerseys, presented by Capital Blue Cross, featuring a Roman Numeral ‘V’ logo in recognition of the team’s fifth season. And Lehigh Valley improved to 4-1-0 on Opening Nights. Greg Carey joined some exclusive company by scoring the Phantoms’ first goal of the season. After inadvertently blocking a point-shot by Phil Myers, he was able to find the puck at his skates and swing over towards the left post to beat Gibson’s right pad. 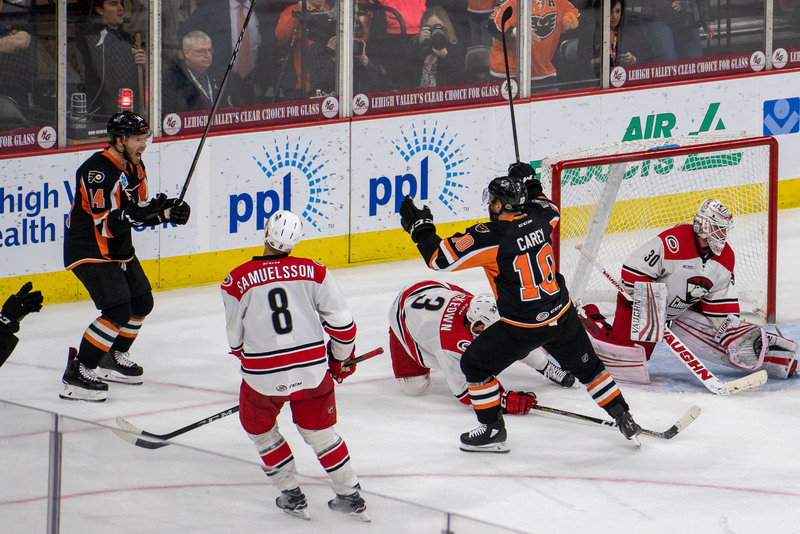 Carey’s goal came immediately after a power play had expired and also came after a slower start for the Phantoms in which the team relied heavily on new netminder Carter Hart to make some nice stops early. Lehigh Valley Phantoms players who have scored the first PPL Center goal of the season now include Carey (2018), Danick Martel (2017), Mark Zengerle (2016), Aaron Palushaj (2015) and Scott Laughton (2014). Early in the second period came another big play when Hart denied highly touted Islanders’ prospect Kiefer Bellows on a breakaway to preserve the 1-0 advantage. Phantoms head coach Scott Gordon observed that the result could have been much different had Hart not been on his toes at those key early moments. Shortly after the Hart breakaway save came a push the other way on an Aube-Kubel steal. With a defenseman narrowing down the angle on him, Aube-Kubel ripped a shot from the top of the right circle that he cranked off the left post and in for a 2-0 advantage just 2:00 into the second period. Aube-Kubel’s next strike came less than five minutes later when he blasted home a back-door slam on a cross-slot pass from reigning AHL MVP (Less Cunningham Award) Phil Varone just seconds after a power play had expired. And suddenly the Phantoms were feeling quite comfortable with a 3-0 advantage. Bridgeport finally broke through on their 21st “shot” of the game that really wasn’t exactly a shot. Chris Bourque’s power-play entry from the right circle hit off the side of the skate of Bellows in the low slot and redirected in to cut the Phantoms margin to 3-1. Both teams traded some rapid-fire scoring outbursts in the third period. The Phantoms scored back-to-back just 51 seconds apart to stretch its advantage to 5-1. German Rubtsov smartly pushed the puck over to his backhand in the low slot to find an opening past the left skate of Gibson for his first career pro goal at 7:50 into the third after a nice assist by Kase in transition. Mark Friendman’s secondary assist connecting with Kase through center sparked the play. And at 8:41 it was vintage Greg Carey for his second goal of the night as he received a puck on the right boards with his back turned to the net but created an impressive shot when none seemed available thus scoring on a rocket of a goal that was assisted by T.J. Brennan and Friedman. Lehigh Valley’s 5-1 lead was in jeopardy when the team took consecutive penalties thus affording the Sound Tigers 90 seconds of 5-on-3 time. Hart came through with some of his best stops of the night but Bridgeport finally broke through on a Mitch Vande Sompel strike for a 5-2 margin. Just 17 seconds later it was Michael Dal Colle ripping one in the high slot for a 5-3 game and suddenly the Sound Tigers had life. But Lehigh Valleey successfully killed Bridgeport’s 6-on-5 desperation at the end leading to Phil Varone’s empty-net goal with 42 seconds remaining following a steal by Tyrell Goulbourne and also assisted by Colin McDonald. Bridgeport out shot the Phantoms 33-29. Lehigh Valley was 0-for-4 on the power play however two of their goals were scored immediately after power plays had expired. Bridgeport finished 2-for-5 on the man advantage. The Lehigh Valley Phantoms return to PPL Center on Friday, October 12 against the Springfield Thunderbirds for Game #2. The Phantoms will travel to Springfield the following night for the team’s first away game of the season. 1st Period-1, Lehigh Valley, Carey 1 (Myers, Aube-Kubel), 5:52. Penalties-Toews Bri (boarding), 3:40; Bardreau Lv (boarding), 12:34. 2nd Period-2, Lehigh Valley, Aube-Kubel 1 2:00. 3, Lehigh Valley, Aube-Kubel 2 (Varone, Carey), 6:51. 4, Bridgeport, Bellows 1 (C. Bourque, Aho), 16:54 (PP). Penalties-Ho-Sang Bri (elbowing), 4:45; Wotherspoon Bri (interference), 8:56; served by Vecchione Lv (bench minor – too many men), 10:30; Bardreau Lv (holding), 16:19; Jones Bri (roughing), 19:47; Friedman Lv (slashing), 19:47. 3rd Period-5, Lehigh Valley, Rubtsov 1 (Kase, Friedman), 7:50. 6, Lehigh Valley, Carey 2 (Brennan, Friedman), 8:41. 7, Bridgeport, Vande Sompel 1 (Ho-Sang, Dal Colle), 11:01 (PP). 8, Bridgeport, Dal Colle 1 (Ho-Sang, Vande Sompel), 11:18. 9, Lehigh Valley, Varone 1 (McDonald, Goulbourne), 19:18 (EN). Penalties-Jones Bri (roughing), 4:34; Myers Lv (hooking), 8:55; de Haas Lv (cross-checking), 9:25. Shots on Goal-Bridgeport 10-11-13-34. Lehigh Valley 10-10-9-29. Power Play Opportunities-Bridgeport 2 / 5; Lehigh Valley 0 / 4. Goalies-Bridgeport, Gibson 0-1-0 (28 shots-23 saves). Lehigh Valley, Hart 1-0-0 (34 shots-31 saves). Referees-Jordan Deckard (14), Jeremy Tufts (78). Linesmen-Luke Murray (92), Jud Ritter (34). 1. I am happy to see Colin McDonald back and wearing the C. He is one of those guys that I always dreaded seeing play against the Phantoms, especially during his years in Bridgeport. I am glad that he is a Phantom. He reminds me of Boyd Kane in that manner. 2. The banner ceremony seemed more like an afterthought. There could have been a better lead-in, perhaps a short video highlight of last year. Just another example that the overall goal of the front office is not hockey-first. 3. As with Kram’s assessment of Rubtsov, I am looking forward to watching the development of DeHaas and Drake. 4. The 2018-19 Phantoms should be a very exciting team to watch. The forward depth is incredible and the defense should be adequate. The current roster, including the contract guys assigned to Reading, should be a playoff team even in the event of prolonged injuries and/or call-ups. 5. I am holding all opinion of Carter Hart until about the half-way part of the season. The jump from the junior ranks to the AHL is greater than people think. There are challenges other than the obvious on-ice differences in the game. It was good that Hart helped his team to get a win in his first start, but I am keeping my expectations at a reasonable level. I agree on Colin. I think the veteran leadership can’t be underestimated. Look at all that Wilkes Barre got out of Kostopoulos the least few years. JVR out with a prolonged injury already, in Philly. Wiese will remain up there now, despite passing through waivers, and they’ll get Neuvirth active. Then we’ll await the goalie carousel. Lyon was in Allentown for the game on Saturday as he continues his healing. He’ll need waivers just as Stolie did. Even now–no loss of depth on the F side, and more coming as Leier becomes active. I’m not ready to predict anything as far as Hart’s career. The thing I learned Saturday was that the talent is really there, I guess. Now, it’s a matter of using it. He’s young and still needs to make adjustments and fine tune his game. I guess I’m a little closer to the hype now that I’ve seen him, but the future remains unwritten. Make no mistake, as I wrote in the Hockey Night piece, he will remain a top story for the remainder of the season whether he’s good or bad or something in between. And indeed I agree with those who underestimate the quality of AHL hockey. Forgot to chime in on your t-shirt gripe. Did you notice that there were “only” 6 sponsors on the rally towel? I think there was room for a couple more. Someone dropped the ball. Speaking of sponsors; has anyone else noticed that the Phantoms are the only team that puts a sponsor name INSIDE their primary jersey logo? They did it with the All-Star jersey two years ago too. As a bit of a jersey aficionado, I find this tactic inappropriate. I thought I counted more than 6–but yeah that was a topic of discussion in the 106 on Saturday. Really, though, they can add all the sponsors they want to free giveaways and urinals and whatever else–just don’t ever call it “fan appreciation” then–call it “sponsored tchotchkes” or something. Oh, that jersey detail did not go unnoticed by me one bit. We were even debating whether the sponsor patch needed to be there since the sponsor was already represented. Even the inaugural season logo had the PPL Center depicted, along with the ppl logo–although you can make a case that that’s more appropriate. Not to give them any ideas, but I am glad we haven’t devolved into the sponsor-riddled warm-up jerseys which then can be auctioned off almost every single game. In truth, it would probably flood the market and de-value their precious regular profit auctions even if they did get the charity arm involved in the warm-up variety. Or, perhaps there’s an AHL rule I’m not aware of regarding warm up sweaters.